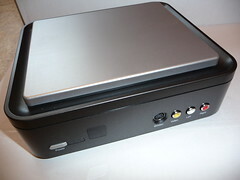 GeekTonic: Is the HTPC Dead Yet? Not Just Yet! Nate Anderson at ArsTechnica has a thought provoking editorial titled “Opinion: the HTPC is dead; long live the HTPC” posted Sunday. I read through the editorial piece and definitely agree with many of his points, but totally disagree with the conclusion and here’s why. Home Theater PC’s are actually thriving in a very narrow niche market of mostly technology savvy people with the funds to spend on the right HTPC setup. There is another solution for getting all Cable/Satellite television content on your HTPC – it’s the Hauppauge HD-PVR (read more about this device here) which works with SageTV, BeyondTV and GBPVR – all popular (non-Microsoft) HTPC software programs. I’m using the HD-PVR with SageTV and have access to all digital, HD content with no DRM or draconian restrictions on that content. It does require a cable box and does record in analog (uses the “analog hole”), but it works great and the picture quality is excellent. Best of all I put it on my HTPC which already existed, no need for purchasing a whole new PC just to get it like you do with CableCard. You don’t have to put a PC by your TV to have a HTPC. Ever heard of a extender? If you aren’t in tune with the HTPC world you might not have, but just think of it as a small, silent box that sits by your TV. I use the excellent SageTV HD100 Extender, but there are many other options for Vista Media Center users. My HTPC is a large, ugly monster of a computer that is hidden away in my study. I certainly wouldn’t want it anywhere near a livingroom or bedroom although you can make a very nice-to-lookout HTPC that fits in that environment also. No, I use that single HTPC computer to serve four televisions in the house – two with the extenders, one with a small HTPC computer and another with a cable modulator (yes I know it’s getting technical in here ;) ). But ultimately, the ideal for me would be to have all extenders connected to the televisions and one computer serving them all. Set Top Boxes Rising? Listed in the editorial are the following: Tivo, Xbox360, Roku Netflix box and AppleTV. You could add to that the Vudu, Playstation (with the video service), and even the new DivX Connected DSM-330. Each of these devices have some very strong points, but I think in the end the consumer is going to want a single device to handle all media including TV, online video, music, photos and games. The only way to reduce the number of boxes near the TV is to do this and not to go with multiple set-top boxes. I have Netflix Watch-Now on my HTPC, Pandora Radio, as well as access to online video, TV content from my cable company, my personal music collection and all of my photo collection all accessible with a remote control at any television set. I agree with many of the points in the ArsTechica editorial including the problems with CableCard, ugly computers in your living room and the high price-point of entry for HTPCs, but I do believe the HTPC market is still in its early stages and will live on in one form or another as “brain” of the home theater setup eventually. The real question is who will make it easy enough and cheap enough to win over the pocketbooks and popularity of the masses.